It's rare that I find a PEPLUM film not worth revisiting again and again and well, this film is one of them. Production values are excellent (sets, cinematography, etc) but the film is dull, dull, dull. I love dramas set in Antiquity and we see how people lived in the past but this one is not an inspired recreation. Things aren't helped much with Beba Loncar sporting the worst wig in any PEPLUM film (and that's saying a lot). Directed by Ferdinando Baldi, who also directed the Alan Ladd film DUEL OF CHAMPIONS, which sorta resembles it. It's a shame though because it has everything going for it except for a good story. This was a companion production, made at the same time as MASSACRE IN THE BLACK FOREST (almost the same cast and crew) and even though there's one big flaw in that film (part of the ending), it's much more memorable than this one. 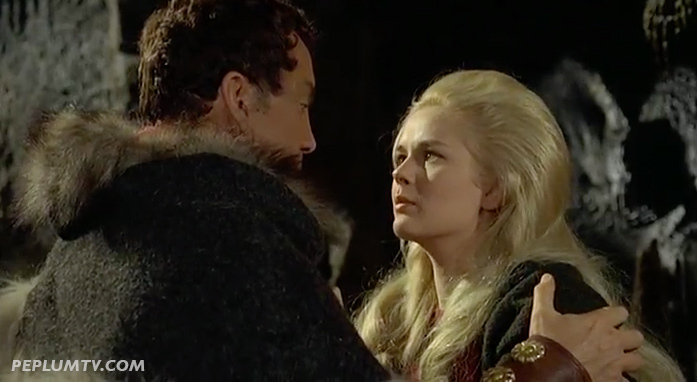 I really like Cameron Mitchell, especially in his Viking movies, which are mostly very lively. I find him a committed and engaging actor, capable of doing exciting action scenes as well as comedy and drama. But no actor (or good production values) can do much with a dull script.